The Ponseti Method is a conservative and manipulative method that is utilised worldwide to correct clubfoot or Congenital Talpes Equino Varus (CTEV). 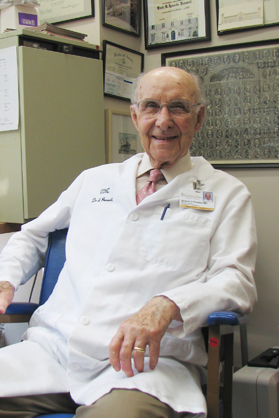 It was developed by Dr. Ignacio.V.Ponsetti (1943-2009) of the University of Iowa hospital and clinics . This method was developed in response to the complications and poor outcomes which came with surgical management of clubfoot.Dr. Ponseti was convinced there was a more efficient and effective way of treating clubfoot this resulted in him studying extensively functional and patho-anatomy of the normal foot and the one which presented with clubfoot. The Ponseti Method has become the gold standard of treatment compared to the other interventions because of its better outcomes .The use of the Ponseti has spread worldwide with evidence shown in 113 out 193 united nations member countries. Numerous research studies in countries across the globe in the last 20 years have shown that more than 90% of cases of newborn children with idiopathic clubfoot can gain initial correction of deformity with the Ponseti Technique. Foot examination and corrective manipulations are best done with the baby resting on the mother’s lap. When applying the plaster cast, the baby is placed at one end of the table to provide room for the mother and assistant on either side. A bottle of milk or sucking on the breast relaxes the baby. During the corrective phase the position of the foot is gradually corrected using a series of manipulations and plaster of Paris casts, then finally a small outpatient procedure is performed to cut the Achilles Tendon (Tenotomy). 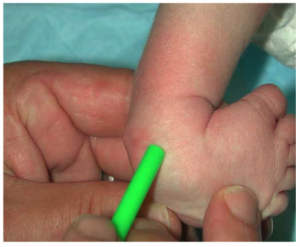 The Corrective Phase usually takes 4–8 weeks and the baby is seen weekly for the treatment. The lateral head of talus is going to be the central point or fulcrum around which the foot moves as it is corrected, and the place where the manipulator’s thumb needs to apply gentle pressure. It is therefore important that it is identified before any correction can occur. The Lateral head of Talus in a baby is usually about 1cm anterior to the lateral malleolus. There are several ways to hold the foot while doing Ponseti manipulations. If it is a right foot as in the picture below, we recommend using the left thumb on the lateral head of talus with the left index and middle fingers holding the medial malleolus but not touching the heel. The right hand’s fingers can then manipulate the forefoot as needed. For a left foot we recommend using the right thumb on the head of talus and the fingers of the right hand going round the ankle, with the left hand free to manipulate the forefoot. 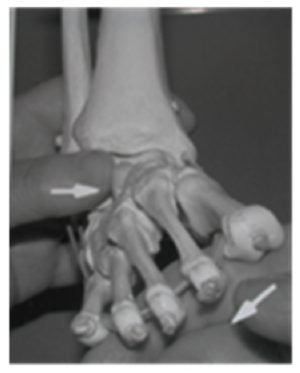 The cavus is corrected by supinating the forefoot, which elevates the first ray, thereby placing the forefoot in proper alignment with the hindfoot. 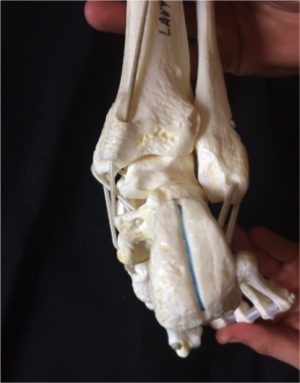 The sole of the foot should be examined whilst doing this, with the aim being to position the forefoot to create a normal looking arch of the foot.Since the cavus usually is not a fixed deformity at birth, correction often occurs with the first cast. 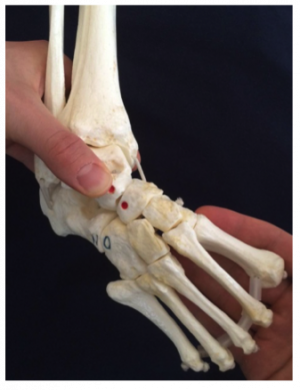 Correction of severe cavus in a stiff foot will need 2 or 3 cast changes with the forefoot in supination. It should be noted that often a Clubfoot can look worse after correction of the cavus. Parents should be reassured that this is temporary. This picture shows the cavus deformity on a model. It can be seen that the arch is high and that to correct it the first metatarsal needs to be elevated (in the direction of the black arrow). Once the cavus is corrected then manipulations to correct the adduction of the forefoot can be started. The plantarflexed foot is slowly abducted while counter-pressure is used on the head of the talus. Ligaments on the medial side of the foot are stretched. The distal end of the calcaneum disengages from its position under the head of the talus and allows the calcaneum to abduct. Plastic model showing method of correction of adductus. While the midfoot is kept in supination and plantarflexion, it is gently abducted under the talus. The thumb applies pressure to the lateral side of the head of the talus, NOT the calcaneum. Use gentle continuous pressure for a few seconds. Repeat once or twice more when the baby is relaxed, and aim for a total of 60 seconds of stretching. Do not struggle with the baby. The aim is to achieve 50-70 degrees of abduction. This usually occurs in about 4 weeks of manipulation. As the abduction increases the manipulator can feel that the lateral head of talus is starting to be covered by the navicular as it moves laterally. Once 50–70 degrees of abduction is achieved the talus is usually fully covered. The varus of the heel and the whole foot does not need to be actively corrected because it corrects automatically as the forefoot adduction is corrected. While the forefoot is abducted the navicular, the cuboid, and the entire foot are displaced laterally in relation to the head of the talus. The anterior portion of the calcaneum follows, and automatically the heel varus deformity is corrected. This is better seen from behind as in the pictures below. If you look at a model of the clubfoot from behind you will see that as the forefoot is abducted so the heel varus corrects automatically. 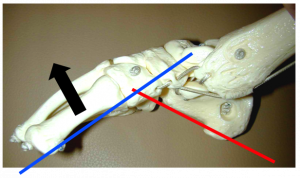 The heel on the left is in varus (tilted towards the midline) but as the forefoot is abducted it tilts in the direction of the white arrow until it reaches a neutral or slightly valgus (tilted away from the midline) position. The heel does not need to be touched. 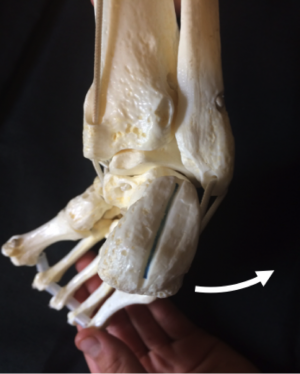 This automatic correction of the varus heel is due to the shape of the joint between the talus and the calcaneum and is known as “Kinematic coupling”. The improvements obtained by each manipulation are maintained by immobilizing the foot in a well-moulded plaster cast for 7 days, before removing it for the next cast. 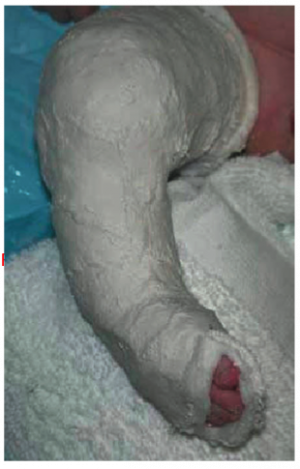 The application of casts is a crucial part of the correction of clubfoot deformity. The cast is needed to maintain the correction that has been achieved by manipulation. If the cast is badly put on it can slip and lose correction, it can also cause rubbing and skin breakdown. Like all skills it is best learned by practical demonstration but this chapter outlines the key points. 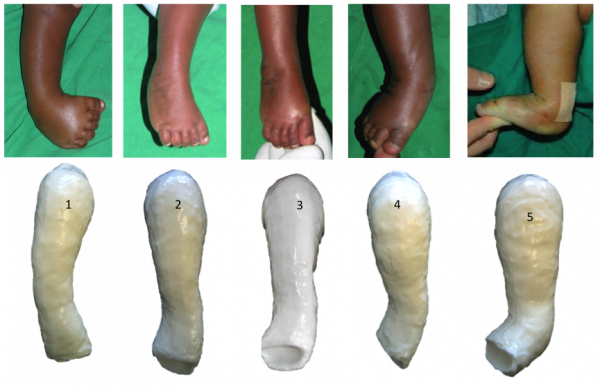 Read more details about Casting Process for Clubfoot on the following Physiopedia Page. The tenotomy corrects the rigid equinus. It is a complete cut through of the Achilles Tendon, not a Tendon Lengthening. It creates a very small incision - it is known as a percutaneous (“through the skin”) tenotomy. Read more details about Achilles Tenotomy on the following Physiopedia Page. When the deformity relapses in spite of proper splinting a simple operation may be needed when the child is over two years of age. The operation, Tibialis Anterior Tendon Transfer, consists in transferring the anterior tibial tendon from its insertion on the medial side of the foot to the third cuneiform.When the deformity relapses in spite of proper splinting a simple operation may be needed when the child is over two years of age. The operation consists in transferring the anterior tibial tendon to the third cuneiform. Clinicians with limited experience in the treatment of Clubfoot should not attempt to correct the deformity. They may succeed in correcting mild Clubfeet, but the severe cases require experienced hands. Referral to a center with expertise in the non-surgical correction of Clubfoot should be sought before considering surgery. ↑ 1.0 1.1 Radler, C., 2013. The Ponseti method for the treatment of congenital club foot: Review of the current literature and treatment recommendations. International Orthopaedics, 37, pp.1747–1753. ↑ Zwick, E.B., Kraus, Tanja.,Maizen,C.,Steinwender,G.,Linhart, Wolfgang E. 2009. Comparison of ponseti versus surgical treatment for idiopathic clubfoot: A short-term preliminary report. Clinical Orthopaedics and Related Research, 467, pp.2668–2676. ↑ Shabtai, L. et al., 2014. Worldwide spread of the Ponseti method for clubfoot. , 5(5), pp.585–590. ↑ 6.00 6.01 6.02 6.03 6.04 6.05 6.06 6.07 6.08 6.09 6.10 6.11 6.12 6.13 6.14 6.15 6.16 6.17 6.18 6.19 6.20 6.21 6.22 Africa Clubfoot Training Project. Chapter 5 Africa Clubfoot Training Basic & Advanced Clubfoot Treatment Provider Courses - Participant Manual. University of Oxford: Africa Clubfoot Training Project, 2017. ↑ Gopakumar, T. & Rahul, M., 2014. Ponseti technique in the management of Idiopathic club foot. Kerala Journal of Orthopaedics, 27(1), pp.15–17. ↑ Staheli, L., 2003. Clubfoot: Ponseti Management. GlobalHELP Publicatioons, pp.1–32.